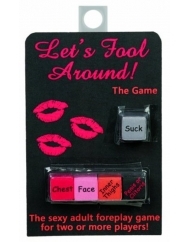 Let's fool around is a fun game where each player selects a body part die to represent them. if there are more than four players, team play is best. players take turns rolling all of the dice in play. the action you roll on the red die is what you must do. you decide which player you perform the action on by selecting one of the other dice. then you perform the action! wait until you read all the game plays! this might be the most fun dice game you have ever tried!